I look forward to ordering several pairs for my riding buddies as gifts. Just a friendly hello, & letting ya know I received the socks. Wow, def impressed with the quality. I got a pair of some Specialized crew length. Anyway, they feel like sandpaper compared yours. Anyway, thank you again. We will be in touch about any bulk order, if it materializes. Take care! best because: they look good, I like the stretch, they breath great, they have the ability not to stink even after a 50 mile bike ride. Actually they almost never hold odor, how they do this i dont know but I like it. First of all Thank You for getting back with me. That is great customer service, which is very important to me. I will surely be making another order and recommend your company to my friends. I will send a photo The first chance I get. Chris - the socks I ordered just arrive. OMG - VERY NICE looking. I will try a pair out today on a run. If they perform as good as they look, I have a new sock source no matter what! I am an ultra distance runner, so I go through lots of socks and shoes! Keep those 70-% off deals coming - if these work out, I'll be doing lots more bizz with you. Love the socks...thank you for the extras. Love the socks they look great and fit fantastic. I'll wear mine for biking, running, and for work. Most likely I'll order more once my son sees them. Great price and fast delivery. Thank you, I'll recommend you to my friends. I believe it was Chris who signed the receipt in my order. I placed and order for 5 pair of your gray socks and was surprised to see that I received 5 extra pair and another extra pair with your logo on them. This was all after I received a 60% discount on the original 5 pair. I just wanted to THANK YOU guys for your awesome customer service. The discount was enough and the extra socks are greatly appreciated. I will spread the word about the quality of your socks and your customer service. Got the last order and one ride in before the family pilfered them all leaving me barefoot! :) Love 'em! Thankyou very much, the socks arrived yesterday, and they are sensational� As soon as you get you site up and running with Australian postage I will forward it onto my cycling buddies. Thanks again for your help and looking after me with the special deal.. I will be purchasing from you guys again. yes I love them! I would definitely want to get more. Right now I'm asking a few friends if they would like to buy them so that we can just buy all at one time. I will keep you posted. I have your email and phone#. Please keep my contact info on your end. RE: PS: what do you do with all these socks? I teach indoor cycling. When I start a new program or upgrade a one hour class into a two hour class I give the first group to go through it a pair of socks for being guinea pigs. I also give them away to newbees and as incentive gifts to continuing participants. As I mentioned, I did receive my socks yesterday. I was struck first by the designs; they're funny and adorable! Nothing says exercise like a girl in a martini glass. But the best part is--and you'll be glad to hear this--is how well they work. I'm a big fan of polypro socks, and wasn't sure if CoolMax could compete. (Your prices, thankfully, made it possible for me to try.) But they did in fact perform just as well, and particularly well in wet/cold conditions when doubled up, which is the best way to wear socks during a Wisconsin winter anyway! So once again, thank you so very much for helping me with my order. I'm glad you were willing to work with me as just couldn't be more pleased with my new socks, so much so that I've even posted a couple of tweets about them. It's a good bet, I think, that you can expect another order from me in the future. Thanks for the great customer service. Your product is a great value. The socks look really great & I got alot of compliments on them. I just received my delivery containing 10 pairs of socks. Prior to placing my order, I had quality concerns based primarily on price. As a large man, one size fits all is usally a sign that one size fits none. I started writing this email before I tried on your socks. I thought that I might as well see if they fit before completing the email. 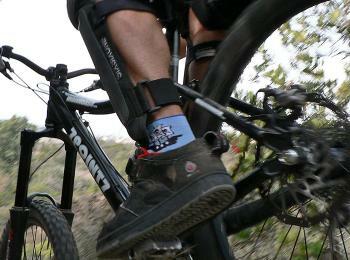 Your socks fit better than most of your competitors socks. I hope to see additional new designs in the future, I would like to see other phrases similar to "try to keep up". I will be ordering again. These socks are so comfortable, I wear them every day to work! Thank you so much for the socks and they are great. They came out perfect. Just to let you know, my guys LOVED the socks. They are excited to wear them in our first meet tomorrow. I have purchased your socks and REALLY like them. They are comfortable and fit well. My husband is now wearing them too. I�ve also mentioned them to several of my friends. I will continue to buy from you as I have yet to find a more comfortable pair of socks for the price that you offer them at. Got my socks yesterday; very quick delivery from one coast to another as usual! Not only do I wear these with my bike shoes but I always wear them to work now as well, they just work so well at keeping my feet dry. a dozen+ ought to keep me going for the summer :) no more comments or orders for awhile. BTW, I'm not tootin' up a storm, I really do wear them to work, I work freight during the overnight (an after retirement job to keep me out of trouble) and it's bull work and I'll be 52 this year. You sweat like a swine, even during NH winters and they really do work wonders for my feet with a pair of Merrells or Tevas, and of course........with a pair of Specialized Tahoes. Got my socks today and it was so appropriate since I picked up my new Trek 7.5 FX today and put it right on the trainer. They are very comfortable and wick great! I ordered and received 100 pairs of custom socks and I just love them. Delivery was fast, and the product is great. They are by far the most comfortable socks I have ever worn. Great job. "I just wanted to drop you a line and tell you that I have purchased 2 pairs of socks from you and I am happy to say that I am very pleased with them. I am also very satisfied with how fast you got them to me. I do alot of Mtn. Biking and I have felt a big difference in how much cooler my feet are after a ride. Thank you very much. I will be a customer for life. 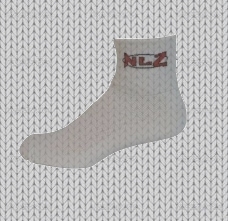 I will spread the word about NLZ." Wanna see your comments on this page?